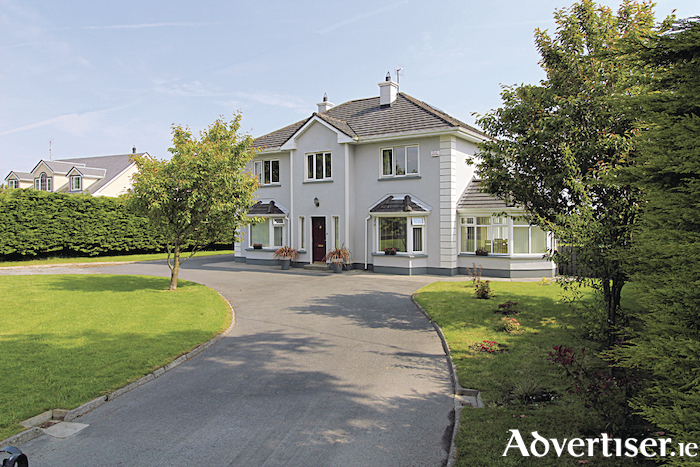 New to the market with Mullery Auctioneers is a stunning detached home set in beautiful landscaped gardens at Ower, a short distance from Headford. This owner occupied home has been meticulously cared for and is presented in pristine decorative order. The residence is generously proportioned and comprises a welcoming entrance hall with tiled floor and a luxuriously carpeted stairs. Off the hall to the left is the living room with feature fireplace and two windows. On the opposite side of the hall is a family room with solid fuel stove and wooden floor. This room opens onto a sunroom at the side of the house and the kitchen at the rear. The kitchen is well fitted with a range of wall and floor units and a central island unit. Off the kitchen is a utility room. Also on the ground floor is a playroom or fifth bedroom and guest WC. Upstairs features a spacious landing, four bedrooms,and a main bathroom. The master bedroom is cleverly designed with sliding mirrored doors opening to reveal wardrobe space and access to a well-appointed en-suite. For further details, see www.mulleryauctioneers.ie or call Mike Mullery of selling agents Mullery Auctioneers on 087 6424106.